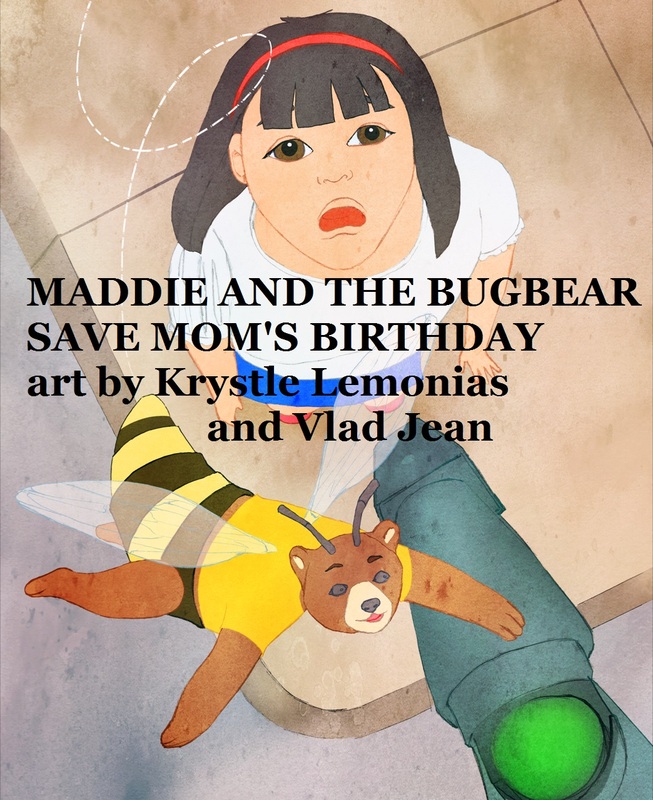 Six-year-old, Maddie, and her stuffed bugbear, Bob, find the confidence to buy milk at the corner store for Mom’s birthday cake. She’s short but is growing, clever and bold. Give her a job and she’ll just ask for more. With wings and some fur, he flies through the air. He’s there for Maddie and knows she’s the one. Do anything for her under the sun. Maddie knew it was a big day today. Dad stayed home from work, but they didn’t play. They planned something big, like never before. It was Mom’s birthday. She turned 34. Gifts, balloons, candles, and even ice cream. The whole thing was like a marvelous dream. But something was missing. Where was the cake? Dad needed some milk before they could bake. Milk’s easy to find, just down at the store. Not more than a block, couldn’t ask for more. Just open the door, you’d see it right there. But they might not make it. Life wasn’t fair. Cause Dad couldn’t go. He had to watch John. Maddie’s little brother, not even one. He caught a cold, wasn’t feeling his best. He’d fallen asleep and needed the rest. Dad asked if Maddie could go in his place. She’d walked there before, had been a real ace. She’d never gone alone. This much was true. But she was smart, and had more than a clue. She looked back at Dad, her eyes opened wide. Now she just wanted to stay right inside. But Dad knew Maddie was up for the job. Maddie looked at her friend, Bob the bugbear. He was awesome, friendly and always there. A gift from her Mom when she was a child. He protected her from all that was wild. She bet Bob could help her get to the store. He was strong, could fly and loved to explore. She hugged him tight and nearly felt better. She’d do her best to fix up the matter. Bob leapt from the floor and buzzed in the air. He said they could do it, knew they’d get there. He wanted to help. They needed that milk. Maddie looked up, and Bob gave her a smile. He knew she was great, and so versatile. She had always been cool, smart, fast and strong. Could solve any problem, right any wrong. “Okay,” Maddie said, and gave Dad a nod. But still wasn’t sure. She felt a bit odd. She had been to the store. This much was true. But this felt strange, and seemed out of the blue. Dad said she’d be fine and gave her a wink. The owner liked Maddie, knew she could think. She always smiled and had something to say. And Bob gave a thumbs up with a loud roar. So they walked outside, and took a quick right. Maddie looked nervous, but still quite the sight. Dad saw Maddie go, but stayed at the door. Kept an eye on her like never before. The neighbors liked her. They’d be no problem. Still he watched her. She meant the world to him. Maddie waved to Dad, and then bowed her head. Miss Shade was next door, and always seemed mad. She squinted and frowned, and had a loud voice. They would avoid her, but now had no choice. “Don’t worry,” Bob said. “Miss Shade’s not around. But Maddie knew better, kept walking fast. Miss Shade was near and their luck could not last. They raced ahead, but then saw more danger. It was Spot the dog. He was no stranger. He’d been awesome at first, much to Bob’s joy. But then got mean, and made Bob a chew toy. She kept going, so he wouldn’t worry. But Bob did, so she walked even faster. She’d get that milk or face a disaster. Then things got worse and Maddie’s eyes went wide. She saw the traffic light and almost cried. She knew to walk on green, never on red. But she always crossed while holding a hand. Bob saw the light change and knew they could go. Maddie reached for him, but did it real slow. He pulled Maddie forward with the green light. Maddie nodded and they walked into the store. She looked at the owner, her back to the door. She knew he was nice and wanted to help. But Maddie could barely get out a gulp. “Do you want some milk?” the owner said and smiled. “Yes, please,” Maddie said, her voice soft and mild. “It’s for Mom,” she said, still feeling some fear. He gave her the milk and flashed her a grin. She took it and smiled. This looked like a win. Maddie had the milk. They could bake mom’s cake. “Dad’s proud,” the owner said, waving his phone. “We all watched. So you were never alone. “Have a nice day,” Maddie said with a wave. Then she crossed the street, not worried, but brave. She smiled at Dad, who still stood on the stoop. He said she could do it, and she let out a whoop. New stuff was tough, but you should at least try. Maddie nodded as they passed the green light. She agreed, but now thought things looked all right. Bob let out a sigh, but still felt afraid. He saw Spot frown like she got a bad grade. “It’s fine,” Maddie said and held out her hand. She gave Spot a pet, and found a new friend. Yet Bob looked at Spot and still felt distressed. Yes, Maddie was cool and he was impressed. But they still weren’t home, had a ways to go. Disaster might strike. Bob just didn’t know. And then Miss Shade appeared at her front gate. She scared even Dad. There was no debate. She blocked their path home. Now what could they do? Dad needed the milk. They had to get through. But Miss Shade just smiled, and said, “You did good. Maddie said, “Thank you,” and looked to her Dad. And he waved to the entire neighborhood. They knew Maddie could buy milk at the store. Every day she did more than before. They had faith that she would pass any test. And all knew her Mom would be quite impressed. Maddie looked back, amazed at their journey. “Maybe so,” Bob said. “But you got us back. Maddie shrugged and led him through their front door. They had the milk, but still had to do more. She looked at Bob, and he flashed her a grin. Maddie smiled ear to ear. Mom loved her cake. With the milk bought, it was easy to make. Mom smiled back, sure Maddie’s future was bright. She braved the new task and came back all right. “Cool,” Maddie said, happier than ever. She learned so much and proved she was clever. And with Bob there was so much she could do. “Then what’s my next adventure?” Maddie said. Her Mom and Dad shrugged. “Who knows what’s ahead? Each day is special with so much to see. “Go with Bob and explore all that’s out there.